Cathie Rowand | The Journal Gazette The Rev. Brian Flory, pastor at Beacon Heights Church of the Brethren, stands near the church building, which in December had solar panels installed on its roof. 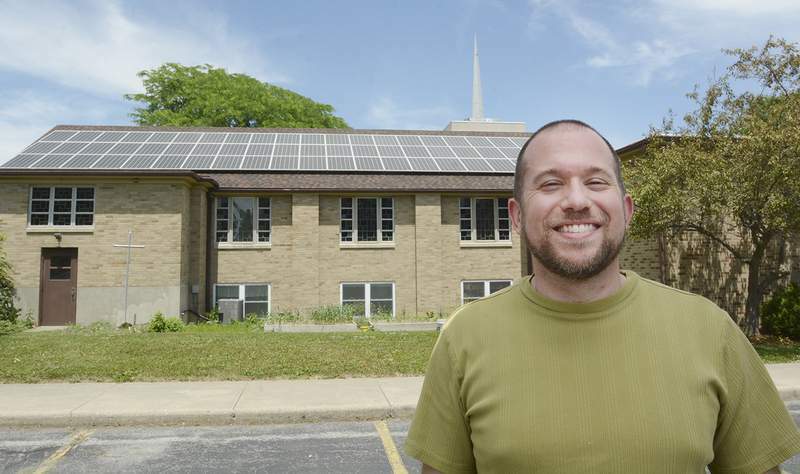 Two Fort Wayne churches that recently installed solar panels will shed light on the technology during educational sessions open to the public June 18. Beacon Heights Church of the Brethren and Plymouth Congregational Church of Fort Wayne-United Church of Christ will host the sessions, which are sponsored by Hoosier Interfaith Power & Light. The statewide nonprofit organization distributed grants for solar power set-ups to the two congregations and 22 other religious groups in Indiana. The money came from a legal settlement American Electric Power struck with the U.S. Environmental Protection Agency, eight states and 13 citizens’ groups over pollution-related issues. Through the programs, Interfaith Power & Light is urging other congregations and individuals to go solar, said the Rev. Brian Flory, pastor of Beacon Heights. The church in northeast Fort Wayne has had a solar installation on its roof since December. "We have already seen a drastic decrease in our electric bills – again," said Flory, who explained the church already substantially cut its electric usage to qualify for the grant. The first step – installing LED lighting fixtures – brought about a 45 percent savings, he said. The solar panels cut the church’s March and April bills from about $700 last year to about $80 this year. Meanwhile, because of the $24,000 grant Beacon Heights received, the payback time for the $44,286 installation was cut from 20 years to around eight, Flory said. The Rev. John Gardner, Plymouth’s pastor, said the arrays on the church’s educational wing’s roof was done last fall. He enjoys seeing how much electricity is being generated in real time on his office computer. "We’ve had a few snags along the way just getting the equipment up and running, but it’s been just wonderful," he said. "I mean, putting the sun to work for us in such a way that doesn’t foul or pollute the environment is a wonderful thing, and we’ve had great support in the congregation." Both congregations were required to have a percentage of their membership agree to reduce electrical use at home to receive a grant. Turner Chapel AME Church also received a solar grant; however, its pastor, Kenneth C. Christmon, could not be reached Thursday about progress. The June 18 seminars will begin at 9:30 a.m. at Ply-mouth, 501 W. Berry St., and at 2 p.m. at Beacon Heights, 2810 Beacon St. Participants can register at 423-9424 for Plymouth’s session or 482-8595 for the one at Beacon Heights. Both will be conducted by Ray Wilson, an engineer and consultant on the board of Interfaith Power & Light. The programs are free.